Tom Hardy is in full Al Capone mode on the set of his latest movie Fonzo. Hardy is one of the best and most dedicated actors working in the business today, which is why he's such an in-demand talent. He's currently filming a biopic about the infamous gangster and we had previously been treated to photos of Hardy in his Capone outfit. But now he's shared some photos, displaying the full makeup treatment he's undergone to look more like the historical criminal, and it's pretty intense. Taking to his Instagram, Tom Hardy has shared a few photos from the set of Fonzo, which kicked of production at the end of last month. This time, not only is he in classic gangster garb, but his face makeup makes him look much more like Al Capone than he did previously. Hardy is going through a transformation for this part and if he's this committed to the look, it will be interesting to see what he actually brings to the performance. He also appears to be having fun with the whole thing, joking about how awkward he looks in the getup. Al Capone has been the subject of major Hollywood movies before, most notably in Brian De Palma's The Untouchables. But Fonzo is going to be radically different. While it's still a biopic, the movie is going to focus on the last year of Capone's life after spending years in jail. Tom Hardy will depict the gangster at the age of 47, which is dangerously close to when he died at the age of 48. 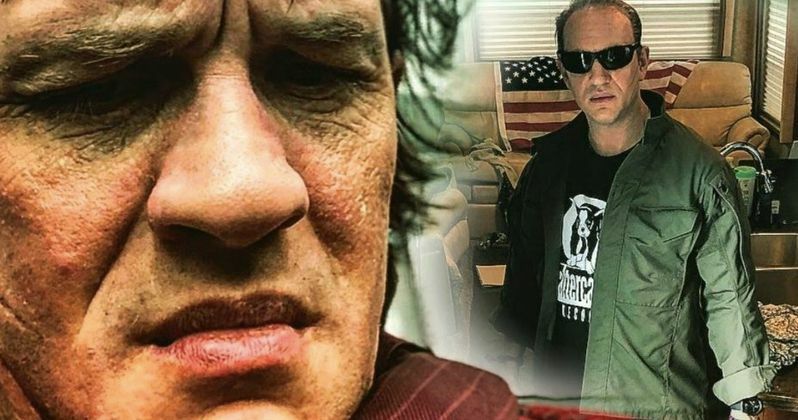 Joining Hardy in the unconventional biopic will be Matt Dillon (Crash), Kyle MacLachlan (Twin Peaks), Kathrine Narducci (The Sopranos) and Linda Cardellini (Daddy's Home). Aside from the fact that we're going to get one of the most interesting actors working today playing a fascinating historical figure in Fonzo, there's also the added layer of the director for strange appeal. Josh Trank, who famously directed the trainwreck Fantastic Four reboot for Fox, but previously directed the entertaining Chronicle, is at the helm. He's been in director's jail ever since Lucasfilm parted ways with him on the Boba Fett movie that never ended up happening. This is his first project to actually get made since Fantastic Four, so this is going to be a big test for his future career. If he pulls it off, maybe he'll get a shot at another big movie. If it doesn't quite get there, he's almost certainly going to be nearing the end of his rope. Fonzo doesn't currently have a release date, but with shooting underway, it wouldn't be shocking if this movie winds up getting a limited release later this year, especially if Tom Hardy winds up delivering an award-worthy performance. But a wide release in early 2019 seems realistic. You can check out Tom Hardy's Instagram posts from the set of Fonzo for yourself below.